Avg. Group Discount of 34.3%! 2008 Platinum Award Winner from Choice Hotels; all rooms are either king or two double beds; limited complimentary continental breakfast bar in lobby; indoor pool; walking distance to shopping mall and grocery store. Sunday-Thursdays by 4pm on day of arrival. Friday and Saturdays 24 hours prior to arrival. 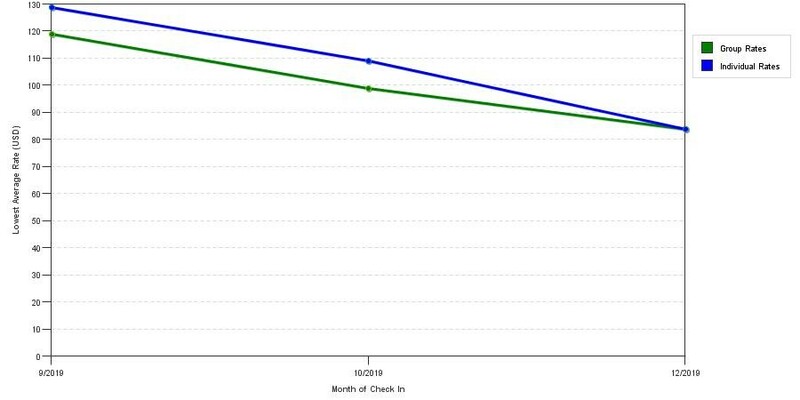 The chart above shows trends of prices for both our group quotes and the best individual traveler prices our rate checker could find at the time the group offer was entered. The best group or meeting displayed is 44.7% in the month of August 2018 and the highest average individual rate is $169 in the month of October 2018. This chart will show past seasonality and also project future months. If you are flexible with dates, you may want to consider staying at Econo Lodge Hadley in a month when rates are lower.